What is meant by the term "intelligence" and, once de- fined, how do we go about achieving a valid measurement of this faculty? This classic textbook, originally published in 1979, and now reissued with a new preface by Sybil Eysenck, incorporates a broad range of findings and reanalyzes much of the existing literature in this area. In The Structure and Measurement of Intelligence, Hans Eysenck draws on methods for determining the effect of genetics and environment on the development of intelligence and examines the validity of the term as defined in relation to internal as well as external criteria. He tests a number of hypotheses on intelligence against empirical research findings and considers various criticisms in detail. 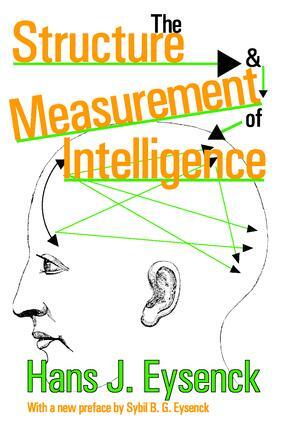 The significance of intelligence and its measurement in society are explored in depth. Eysenck greatly expands upon such questions as: Does IQ measure intelligence? How valid is the nature versus nurture argument? and, How might socioeconomic status influence one's intelligence? Designed primarily for students and scholars in psychology and education, this text will make thought-provoking reading for all concerned with the development and measurement of intelligence in the individual.